"I made this recipe up for a party I had. Now I get calls all the time from people asking how to make it. 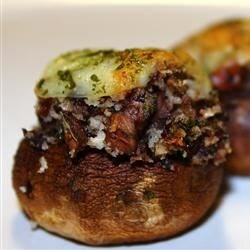 The mushrooms are stuffed with hamburger meat, and are full of flavor." Place ground beef in a large, deep skillet. Cook over medium high heat until evenly brown. Drain, crumble and set aside. In a medium saucepan over medium heat, melt the margarine and stir in the mushroom stems, green bell peppers, garlic, parsley and basil. In a large bowl, mix the ground beef, mushroom stem mixture, dry bread crumbs, soft bread crumbs and Cheddar cheese. Place the mushroom caps, upside down, on a large baking pan. Generously stuff each cap with the mixture. Bake in the preheated oven 15 to 20 minutes, or until the filling is golden brown. I used turkey sausage instead of beef. Good recipe. Lots of room for personalization. They did lack a little zing. I agree that it lacked a little "zip." Next time I will use more cheese and sausage instead of ground beef. Yummy! Try cream cheese instead of shredded cheese. I love this recipe! Mmmmmm!! I also made it leaving out the meat and using more mushrooms. Very tasty! I really enjoy a good stuffed mushroom. Great base for endless possibilities....Creativity can make this recipe an instant family favorite.